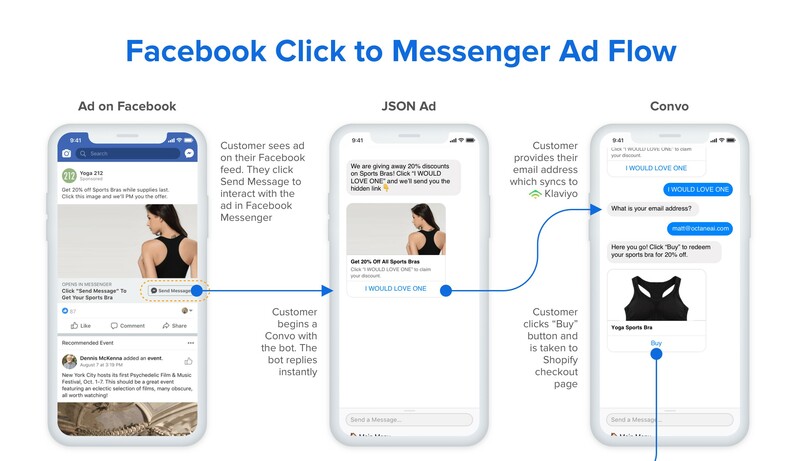 Click-to-Messenger Facebook ads are going to be your new sales weapon in 2019 if you're running an ecommerce business. Why? Because they get customers to engage with your company. And the ROI is pretty sweet too. We've tested Click-to-Messenger ads with our customers and agencies. The results are unbelievable. With the rise of conversational commerce, Messaging apps have revolutionized how businesses interact with their customers. 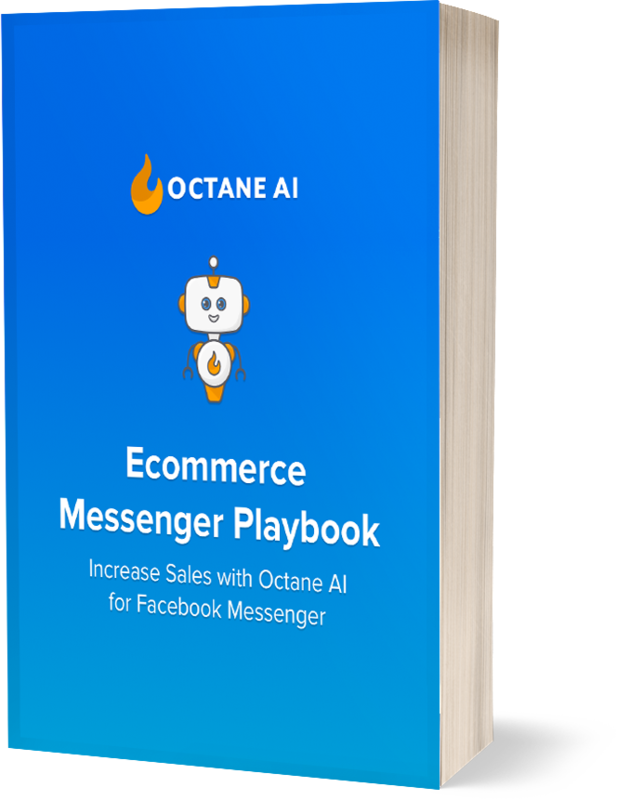 Here at Octane AI, we've noticed that our customers running Click-to-Messenger Facebook ads see a better ROI than traditional Facebook ads. But why are they performing so much better? Because they're so interactive. Instead of clicking on an ad and being taken to a landing page, customers get to interact with your Facebook Messenger bot. After all, 9 out of 10 customers (90%!) want to communicate with brands over messaging instead of email according to Twilio. Since Click-to-Messenger ads are so new, it can be confusing to know what specific terms mean. Not everyone will know what a JSON Ad is and we want to help out. So we put together a quick guide that goes over the terms associated with Click-to-Messenger ads. Think of it as a Click-to-Messenger dictionary. Messages Objective: When choosing the Campaign objective, you will select "Messages" in order to advertise for ads to click into Facebook Messenger. Message Destination: Choose whether conversations are opened in Facebook Messenger or Whatsapp. Whatsapp is also a new promising channel for ecommerce businesses, especially outside the United States. Audience: Choose the audience that will see your ad. This includes saved audiences, new custom audiences, behavior targeting, interest targeting demographic targeting and more. Placement: Chooses where your ad will be displayed. Your options are the Facebook News Feed, Messenger or Instagram. Budget: Choose how much you want to spend on your ad. You can choose a daily budget or a lifetime budget, which stops the ad once the lifetime budget is met. Call to Action: Choose. Send Message is the default option, but you can also choose Learn More, Sign Up, Shop Now, Subscribe, Apply Now and more. JSON Ad: This is basically designing a flow or conversation through your bot builder (like Octane AI). Once the conversation is designed, you then receive a snippet of code that you can place into the Facebook editor when creating your Click-to-Messenger ad. Learn more about JSON Ads here. Quick Replies: These are answer choices that customers can select instead of typing out a response. You can also use quick replies to request a customer's email address, phone number and location. Buttons: Buttons can be clicked by the user to perform a specific action. This can include opening links, opening up your main menu and unsubscribing from the bot. That's it! These are all the main terms associated with Click-to-Messenger ads. If you aren't using Click-to-Messenger ads yet, we strongly recommend you give them a shot.